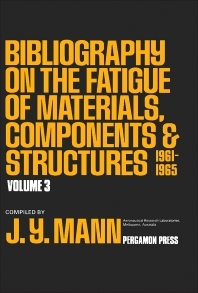 Bibliography on the Fatigue of Materials, Components and Structures, Volume 3 addresses the problems associated with fatigue loadings as evident in branches of engineering and technology. Such debilitating factor also affects the human skeletal system. The book provides several references that show an increasing focus being given to the problem of fatigue in materials, components, and structures. The journals and lists of references used in the book, which discuss the subject of fatigue, are chosen to give an initial identification of citations. These sources are accompanied by computer-based documentation systems. The bibliographical data for each citation are thoroughly reviewed by checking the original bases of publication. The references in the book are arranged chronologically according to its year of publication. Major use has been made of abbreviations for the titles of journals and publications. The book can serve as a valuable tool for doctors, therapists, students, and researchers in the field of medicine.